Toss tomatoes, olive oil, garlic and salt together in a large mixing bowl. Place tomatoes, skin side down, on a lightly greased parchment-lined baking sheet and roast in oven for 1 hour. Remove pan from oven and allow to cool slightly. When cool enough to handle, chop each tomato half into quarters. 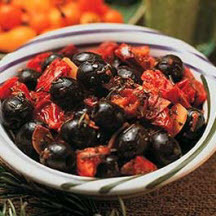 Toss cooked tomatoes with ripe olives, balsamic vinegar, orange zest, rosemary, thyme, and red pepper flakes. Marinate for at least 3 hours before serving. Nutritional Information Per Serving (1/6 of recipe): Calories: 85; Total Fat: 8g; Saturated Fat: 0g; Cholesterol: 0mg; Total Carbs: 4g; Fiber: 0g; Protein: 1g; Sodium: 378mg. Recipe and photograph courtesy of California Ripe Olives.